1. the process of returning to health; the restoration of structure and function of injured or diseased tissues. The healing processes include blood clotting, tissue mending, scarring, and bone healing. See also wound healing. 2. the process of helping someone return to health; compassion by a health care provider is part of this. Authentic perception of the experience of illness in the particular person is the essential basis. healing by first intention (healing by primary intention) wound healing in which restoration of continuity occurs directly by fibrous adhesion, without formation of granulation tissue; it results in a thin scar. Healing by primary, or first intention. In primary wound healing there is no tissue loss. A, Incised wound is held together by a blood clot and possibly by sutures or surgical clamps. An inflammatory process begins in adjacent tissue at the moment of injury. B, After several days, granulation tissue forms as a result of migration of fibroblasts to the area of injury and formation of new capillaries. Epithelial cells at wound margin migrate to clot and seal the wound. 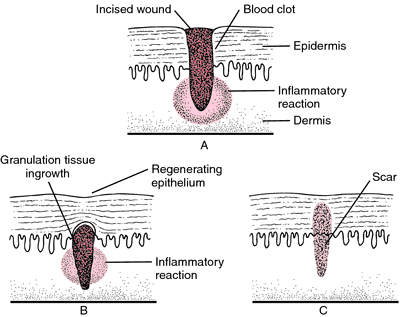 Regenerating epithelium covers the wound. C, Scarring occurs as granulation tissue matures and injured tissue is replaced with connective tissue. healing by second intention wound healing by union by adhesion of granulating surfaces, when the edges of the wound are far apart and cannot be brought together. Granulations form from the base and sides of the wound toward the surface. Healing by second intention occurs when there is tissue loss, as in extensive burns and deep ulcers. The healing process is more prolonged than in healing by primary intention because large amounts of dead tissue must be removed and replaced with viable cells. A, Open area is more extensive; inflammatory reaction is more widespread and tends to become chronic. B, Healing may occur under a scab formed of dried exudate, or dried plasma proteins and dead cells (eschar). C, Fibroblasts and capillary buds migrate toward center of would to form granulation tissue, which becomes a translucent red color as capillary network develops. Granulation tissue is fragile and bleeds easily. D, As granulation tissue matures, marginal epithelial cells migrate and proliferate over connective tissue base to form a scar. Contraction of skin around scar is the result of movement of epithelial cells toward center of wound in an attempt to close the defect. Surrounding skin moves toward center of wound in an effort to close the defect. 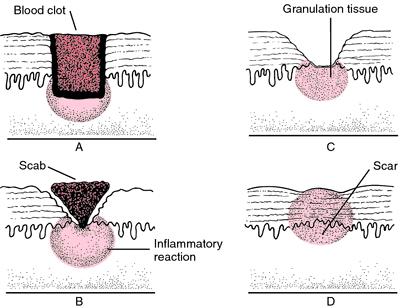 1. wound healing by the gradual filling of a wound cavity by granulations and a cicatrix. wound healing see wound healing. an injury or damage, usually restricted to those caused by physical means with disruption of normal continuity of structures. Called also injury and trauma. wound drain any device by which a channel or open area may be established for the exit of material from a wound or cavity. See also wound healing. wound healing restoration of integrity to injured tissues by replacement of dead tissue with viable tissue; this starts immediately after an injury, may continue for months or years, and is essentially the same for all types of wounds. Variations are the result of differences in location, severity of the wound, extent of injury to the tissues, the age, nutritional status, and general state of health of the patient, and available body reserves and resources for tissue regeneration. The repair of damaged cells and tissue takes place by regeneration, in which structures are replaced by proliferation of similar cells, such as happens with skin and bone; and by formation of a scar, consisting of fibrous structures with some degree of contraction. Since most wounds extend to more than one type of tissue, complete regeneration is impossible; therefore, scar formation is an expected outcome of wound healing. The insertion of drains can facilitate healing by providing an outlet for removing accumulations of serosanguineous fluid and purulent material, and obliterating dead space such as that created by surgical removal of an organ. If the area of injury is not very large, the products of inflammation, small blood clots, and other debris from the wound can be absorbed into the blood stream and disposed of. Wounds that are filled with large amounts of dead cells, blood clots, and other debris must be cleansed in order for healing to take place. This can be accomplished by surgical or chemical débridement or by irrigations. Enzymes are sometimes used to remove the debris by enzymatic action. Since foreign bodies, such as sutures, slivers of glass, splinters, and the like, can delay healing, they too must be removed from the wound to facilitate healing. Patient Care. Assessment of the progress of wound healing begins with frequent inspection of the site for signs of bleeding in or around the wound. Discoloration of the skin adjacent to a surgical or traumatic wound that has been sutured may indicate a pooling of blood in the tissue spaces and the beginning stages of a hematoma. Bleeding in a wound and clot formation can delay healing. Accumulations of serosanguineous fluid and purulent drainage also must be watched for, because they retard the healing process and pose a problem of superinfection. If a drain has been inserted to remove excess fluid, the color, amount, odor, and other characteristics of the drainage must be noted and recorded. If there is more than one drain, the drainage from each should be noted separately. Dressings also must be observed frequently, especially a pressure dressing, which can become dangerously restrictive if there is swelling. Any change in sensation, such as tingling or numbness, signs of impaired circulation, or complaint of discomfort, should be reported to the physician. Other data important to the ongoing assessment of wound healing are the leukocyte count, coagulation tests, and electrolyte levels. An elevated body temperature can signal local or systemic infection. Another sign of infection is the presence of purulent drainage. The color of the drainage is often indicative of the particular infecting organism. For example, a yellow color may indicate presence of Staphylococcus aureus, and a blue-green color may indicate Pseudomonas aeruginosa infection. In a surgical wound, a discharge of serosanguineous fluid on the fourth or fifth postoperative day may signal wound dehiscence and, therefore, should be reported immediately to the surgeon. During the scarring phase of healing, the wound is inspected for changes in size, color, and shape, which can continue for months even in superficial wounds. New scar tissue is usually purplish, raised, and irregular. With time, the color fades, the scar grows smaller, and its surface and edges become less irregular. Sometimes the scar tissue grows to excess and extends beyond the normal limits of the wound. This hypertrophic scar or keloid may require steroid injections or surgical removal. In order to achieve adequate and uneventful healing of a wound the patient must be in a good state of nutrition. Virtually every nutrient plays some role in the healing process; hence, a wide range of dietary nutrients must be supplied, either through oral feedings, supplemental vitamins and protein, or parenteral nutrition. Oxygen is also essential to the healing process. This means that measures must be taken to ensure adequate circulation of blood to the wound, employing measures such as exercise, ambulation when possible, and applications of warmth when prescribed. Positioning also is important to avoid prolonged pressure against blood vessels serving the wounded area. Adequate rest is needed to facilitate healing. The patient should understand the need for rest and the purpose of splints, casts, and other devices employed for immobilization of a wounded part. Mechanical injury to a wound can greatly impede healing by damaging the tissues involved in the healing process. The wound should be protected from friction and direct blows. The affected part must be handled gently, and great care must be used in applying and removing dressings and bandages. Protective bandages and shields made from rubber, plastic cups, tongue blades, and other supportive materials may be needed to protect the wound from additional trauma. Other factors that work against optimal healing are stress, old age, smoking, obesity, and diabetes mellitus. It is thought that in the poorly controlled diabetic patient there is an increased affinity of hemoglobin for oxygen, which hampers the release of oxygen to the healing tissues. Additionally, poorly controlled diabetic patients have an abnormal function of the phagocytes, which predisposes wounds to infection. Although cancer does not itself interfere with the healing process or make the patient more susceptible to infection, radiation therapy, steroids, and antineoplastic agents, as well as the general debility of the patient, do compromise healing in cancer patients. 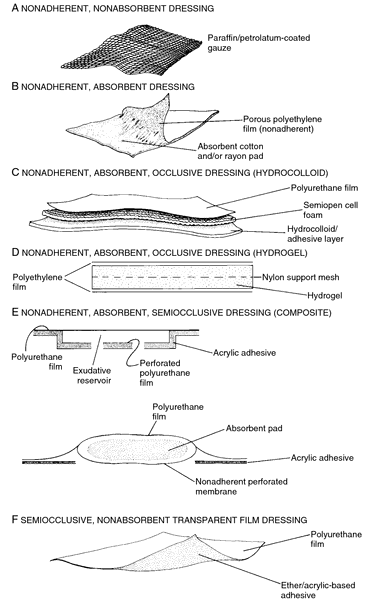 Wound dressing construction and design. From Cohen et al., 1992.
open wound one that communicates directly with the atmosphere. penetrating wound one caused by a sharp, usually slender, object that passes through the skin into the underlying tissues. perforating wound a penetrating wound that extends into a viscus or bodily cavity. sucking wound a penetrating wound of the chest through which air is drawn in and out, as in open pneumothorax. tangential wound an oblique glancing wound that results in one edge being undercut. a process to restore to a state of soundness any injury that results in an interruption in the continuity of external surfaces of the body. Also called wound repair. See also healing, intention. a bodily injury caused by physical means, with disruption of the normal continuity of structures. one in which the skin is unbroken. any device by which a channel or open area may be established for the exit of material from a wound or cavity. See also drain, drainage, wound healing (below). the restoration of integrity to injured tissues by replacement of dead tissue with viable tissue. The process starts immediately after an injury and may continue for months or years, and is essentially the same for all types of wounds. Variations in wound healing are the result of differences in location, severity of the wound, and the extent of injury to the tissues. Other factors affecting wound healing are the age, nutritional status and general state of health of the animal and its body reserves and resources for the regeneration of tissue. topical agents which stimulate healing; includes preparations containing zinc, trypsin, neomycin, dyes and iodine. one caused by a cutting instrument. one in which the tissues are torn. failure to heal despite appropriate treatment being given. one that communicates directly with the atmosphere. one caused by a sharp, usually slender object, which passes through the skin into the underlying tissues. a penetrating wound which extends into a viscus or bodily cavity. chronic, nonhealing wound in which there is granulation tissue but the overlying skin does not adhere. Seen most commonly in the axillae or groin of cats. a penetrating wound of the chest through which air is drawn in and out. one deliberately produced during a surgical procedure, e.g. the original incision. an oblique, glancing wound which results in one edge being undercut. Q. How frequently do people heal from arthritis? what are the chances for it to go away? any statistics? A. arthritis is pain/swelling/stiffness/and redness of joints---arthritis is not a single disorder,but the name of joint diseace from a number of causes--the cause is wear/tear on the joints. threatment: antibiotic drugs/anti inflammatory drugs. most common is rheumatoid/osteoarthritis/an still disease(children under the age of 4,which clears up after a few years)-arthritis may occure as a complication of infection elsewhere in the body, such as chickenpox/rubella/german measles/mumps/rheumatic fever, or gonorrhea. In most cases this disease can only be controled by meds,ther is no cure as of yet. Q. For those that had an epimacular membrane removed, how long was it before your eye healed? How was your vision afterwards? Do you now require or benefit from glasses? A. Epimacular membrane removal can be associated with a variety of ocular conditions and therefore the healing process varies tremendously depending on the underlying pathology. Furthermore, this condition may recur.